This rugged 5-drawer tool chest also doubles as a work center! 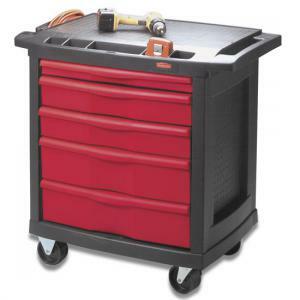 This Work Center Tool Chest features five metal drawers with locking bar, locking wheels and a heavy-duty work surface that supports up to 250 lbs for all types of jobs. This work center also features molded-in storage trays, perf board sides, tool slots and a built-in cord wrap for convenient storage of power tools. This 67 lb. work center measures 32.5" x 19.5" x 33.5" and comes with a one-year warranty against manufacturing defects. NOTE: This item is too large to ship UPS and must be shipped via Truck Service. Delivery Time 2-3 weeks ARO.